In this blog post, I would like talk about a topic we have been discussing at the DSC recently—and that has come up in relationship to one of my past projects as well. During the summer of 2014, I was a graduate research assistant at the DSC, and the goal of my summer project was to show the urban development of Piazza San Marco in Venice through time. At the time, I blogged on this project and the models that inspired me when creating these reconstructions. In summary, my project focused on the digital reconstruction of Piazza San Marco and its surrounding buildings from the ninth until the nineteenth century. In order to do that, I used published diagrams (Vio 1994) illustrating the urban development of the space through time, and from those I created 3D models on SketchUp. Below you can see an example showing the space in the ninth century from two different views. Figure 1. Digital Reconstruction of Piazza San Marco in the ninth century. My interest in the urban development of this space stems from my research on the Ospedale di San Marco, a shelter for pilgrims built in the tenth. In my senior thesis, I researched Dogaressa Alucia da Prata Zen’s involvement with the thirteenth-century expansion of the institution. 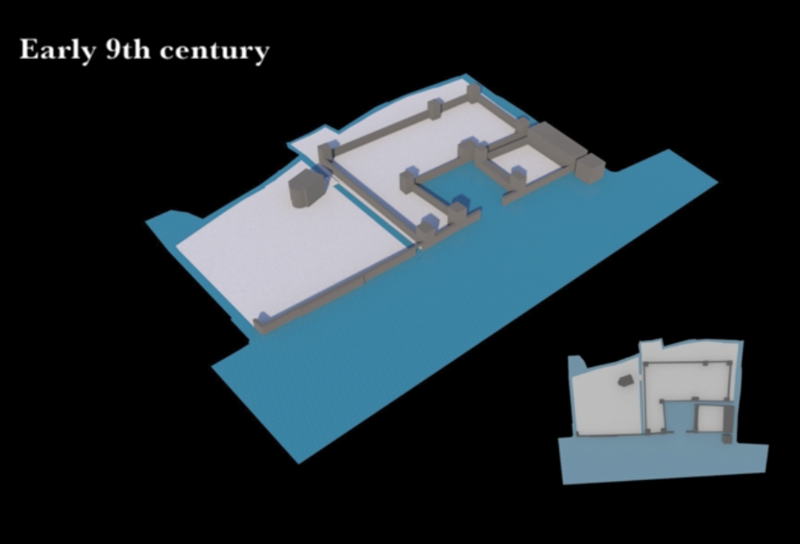 Since the hospital was destroyed in the sixteenth century when the Piazza was completely remodeled, these digital models helped me understand how the space and the relationship between buildings changed through time. Figure 2. Gentile Bellini, Procession in Piazza San Marco, 1496. Because my focus was on the space, and not on architectural details or the interior of buildings, I opted for a simple design in my final models, with the buildings appearing as gray blocks. I made that decision because I did not have enough information about the buildings to create extremely accurate visual representations, and also because that would have significantly increased the time I spent on each reconstruction. Most important, a more sophisticated model would not have changed how we perceive the urban development of the space from these reconstructions. While I based this approach on my objectives and research questions, people frequently question some of these decisions, such as the simplicity of the models, the lack of architectural details, texture, etc. These are valid questions, and they point to larger issues associated with digital reconstructions. There is a great variety of projects available that involve 3D models of historical buildings, but the level of detail and sophistication between them vary significantly. These variations generate interesting points for discussion. First, in most reconstructions, decisions have to be made about data that we do not have, such as lack of information about architectural details or precise measurements of buildings. While it might not look great, sometimes lack of detail in a reconstruction means higher historical accuracy. Another issue can be the level of visual sophistication of 3D models. For example, there will always be a difference in the time and financial investment that a one-person project receives in comparison to an institutional one, and that will most certainly be reflected in the appearance of the final project. Lately, Kaelin Jewell, fellow art history PhD student and research assistant at the DSC, and I have been discussing these issues, primarily concentrating on users’ experience of digital reconstructions considering these choices. To what extent should digital humanists working with 3D reconstructions worry about the appearance of their final projects? How far can we ‘push’ the limited information we have on historical buildings? Although I do not have answers to these questions, it is helpful to think about them not only when creating 3D historical models, but also when looking at projects that involve them. Reference: Ettore Vio. “Le trasformazioni urbane dell’area Marciana.” In Le Procuratie Vecchie in Piazza San Marco, 59-110. Rome: Editalia, 1994.